For security officers, video is a critical tool for active monitoring and investigating, enabling them to effectively secure locations remotely by watching live video feeds and deploying responders when threats are detected. Beyond real-time surveillance, security and law enforcement bodies use video surveillance footage to help support post-event investigations, providing video evidence to solve crimes and evaluating video intelligence from multiple sources to build cases. An important aspect of security, surveillance still poses challenges for even the most adept officers: It’s not unlikely – while monitoring one or multiple camera feeds – for an agent to lose focus or become distracted, missing a crucial detail or object on camera as a result. Sometimes vital evidence captured on video can’t even be detected by the human eye, regardless of the attentiveness of the officer monitoring the recording or live feed. Another overwhelming challenge is the amount of time and manpower that must be devoted to watching video. Especially in post-event investigation, video evidence from multiple cameras, locations, and days can be collected and then reviewed. These enormous quantities of video data translate into hours of manual review. To manage time and resources effectively, officers must limit the amount of video evidence they consider – still committing to watching hours of video footage and running the risk of missing and overlooking critical details. Artificial intelligence-based solutions are becoming the primary solution to these challenges. 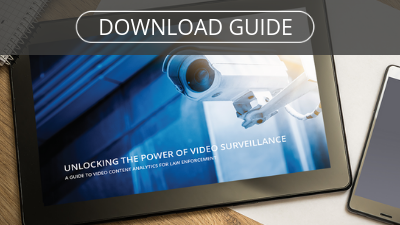 Because – when properly trained – technology can consistently and accurately detect objects that human monitors may not, AI-backed video analytics are becoming a de facto standard for law enforcement worldwide. How do video analytics overcome security surveillance challenges? To detect what humans may overlook or miss, Video Content Analytics (VCA) technology leverages Machine Learning techniques, AI methods for training computers. Video analytics solutions teach computers to detect and distinguish between video objects; extract and identify them; analyze their behaviors and attributes; and classify the data so it can be used for intelligent decision making and security readiness. Video Content Analytics accelerates the review of video so that security personnel don’t have to decide between analyzing video evidence and utilizing their resources for other investigation activities. For instance, when a security agent can identify details about the perpetrator being targeted, he or she can search the video, filtering based on the suspect’s attributes and known features, and eliminate from the video search all objects that don’t match the description. Thus, the investigator can review only the footage and objects that match the suspect. In cases when there is no known suspect or there is little direction guiding the video search, the security team also can leverage AI-driven video analytics technology: A VCA engine can detect, extract and classify video objects to create a structured information database out of the unstructured video data. This searchable index helps investigators quickly and comprehensively understand all video events. Because security work doesn’t always involve post-event investigation, and often requires real-time response to unfolding events, Video Content Analytics can recognize patterns and detect anomalies and suspicious behavior. This means that security personnel can configure notifications to be alerted when unusual behavior may warrant their response. A call to action can be triggered any time an object enters or dwells in a sensitive area, enabling immediate response. Sometimes VCA technology can detect anomalies and abnormal behaviors that would be otherwise invisible to the human eye. Whereas a security officer in a control room monitoring a Video Management System (VMS) may not be able to identify a shadow or reflection of an object, a video analytics solution could be configured to varying levels of detection sensitivity. When set to the highest degree of detection sensitivity, a video analytics engine even could identify a perpetrator’s reflection and extract it as a video object. In cases where criminals are outside the surveillance range, if their reflections appear in the surveillance footage, they can be logged as video evidence to support a case. Video continues to evolve as a key sensor for enabling safety and security. With Video Content Analytics enhancing the value of traditional surveillance and offering solutions to some of the major challenges of security surveillance, teams are empowered to leverage their existing surveillance infrastructure and extend its value. VCA drives productive, proactive and predictive security, resulting in more efficient and effective video investigation and emergency response.